Today I am going to present a number of embroidery designs from Prigorje, which are done on the man's shirt, and woman's blouse, jumper and apron. For a description of this costume see my previous posting. The designs are mostly cross stitch in red with a small admixture of blue, with some supplemental stitches. White on white [or white on ecru] embroidery is also sometimes done on the collar and cuffs of the men's shirt. The men's shirts sometimes have more subtle stitching, as in the following two examples from the area of Medvenice. The apron, the jumper, and the collars and cuffs are smock-gathered. Sometimes these gathers have embroidery done on them, especially above the cuffs. Here are two examples, the first is a collar, the second a cuff. The narrow stripe on the woman's apron is usually woven in, but is occasionally embroidered, as in these two examples. Here are some patterns presented by Ruzmarinka on her blog. I thank her very much for her gracious permission to use her material. Please visit her blog for more information and photos of her region. She may even be willing to make items on commission. Very pleasant designs and easy to execute. 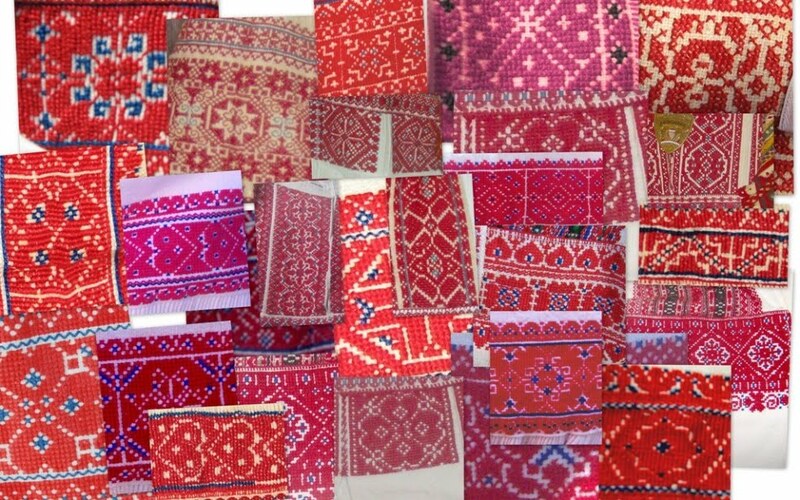 I think that these could have many applications for bringing a little bit of old Croatia into your home. Be creative and make the world more beautiful by making something of beauty.